Time is running out! The guests are being systematically murdered one by one. Who is behind it all? You must determine who the killer is at once!!... Before you’re the next victim. Agatha Christie, often referred to as the "Queen of Crime", is perhaps the most recognized mystery writer of all time. She penned her first novel in 1920 and over the course of a century and a half, managed to delight generations of fans with over 80 novels and short stories. 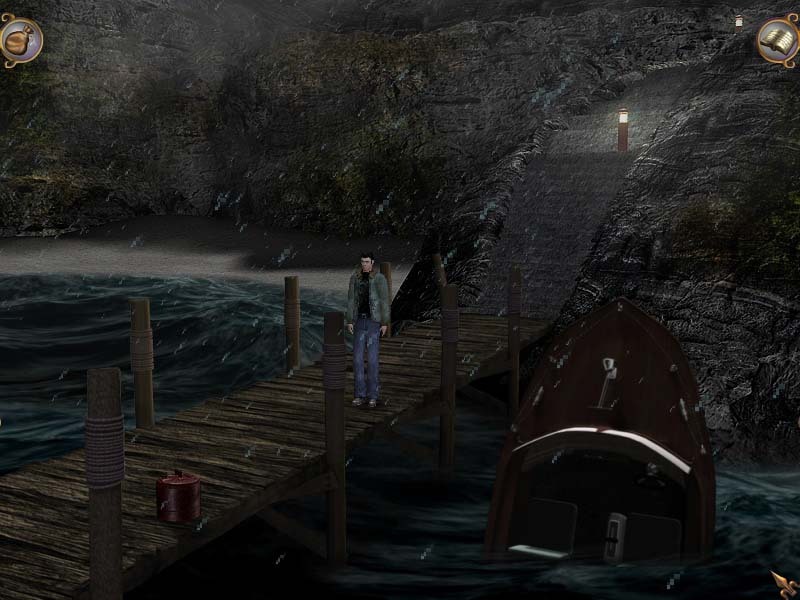 With over 2 billion copies of her engaging mysteries published worldwide, one wonders why it took so long to bring her genius to light in an adventure game setting. 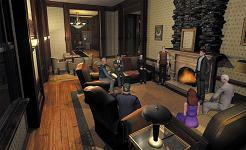 Enter Agatha Christie: And Then There Were None developed by AWE Games and published by Dreamcatcher Games. 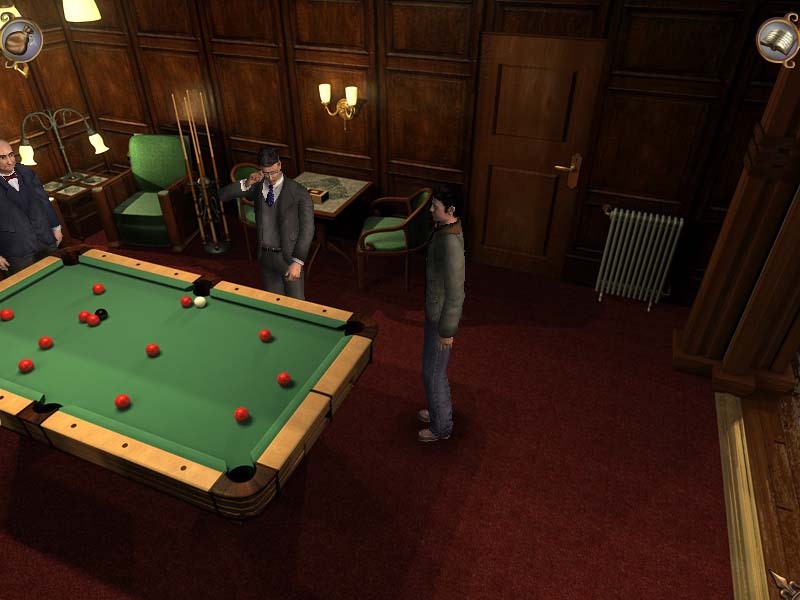 This is a classic 3rd person point and click adventure. I was pleased to discover upon opening the game that the actual novel was included with the game giving us all a chance to enjoy the story twice in different media forms...quite a nice touch. 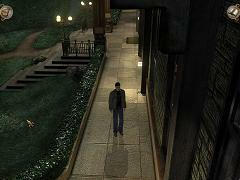 The game loaded without any problems and can be played from the hard drive completely; no CD required. Our story begins inside a train en route to Shiprock Island. It is here that we get our first insight into some of the main characters (or shall I say victims). Personalities are readily apparent from the beginning and assumptions as to their character form in your mind immediately. It’s true what they say about first impressions being the most important. While most of the characters arrive by train, two more arrive by car. Some rather shady behavior is observed along the way leading to more assumptions. All of this, and we haven’t even arrived at our destination! 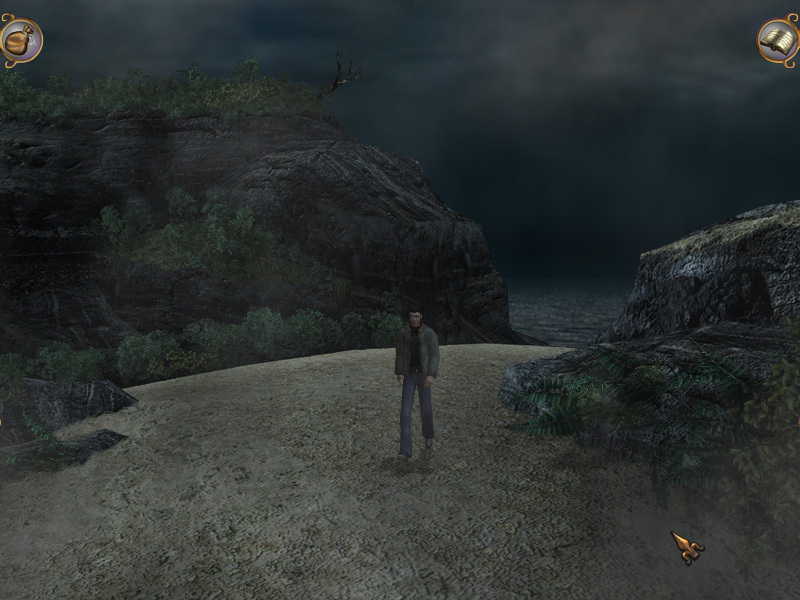 Finally, the guests arrive at a dock where you meet the character you are to assume the identity of for the rest of the game. Playing as Patrick Naracott, you have been hired to ferry the guests via your boat to a mansion on Shiprock Island at the request of a mysterious "Mr. Owen". Upon arrival at Shiprock Island, you have a brief conversation with the butler and then proceed back down to the dock for the return trip home. What a shock to discover that your precious boat has been "scuttled"! In other words, someone has damaged your boat beyond repair leaving you stranded. Who would do such a thing? An immediate investigation is in order! After some initial snooping around the mansion and a few conversations, you are drawn down to the kitchen as the other guests are situated in the dining room for dinner. As you eavesdrop through the door, you learn of a gruesome poem hanging above the fireplace --- Ten Little Soldier Boys which lists the deaths of each soldier boy one by one in a twisted nursery rhyme. A recording is placed on the gramophone and we get to hear the voice of "Mr. Owen" who proceeds to accuse each of the 10 guests of committing a heinous crime at some point in each of their lives. A scream rings out from another room. What’s going on? You will soon learn that the words in the nursery rhyme are being brought to life as a punishment. Tempers flare, fingers are pointed and secrets are revealed. It’s up to you to figure it all out before it’s too late. 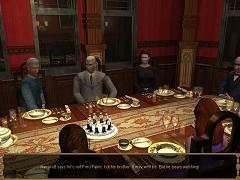 Navigation in Agatha Christie: And Then There Were None is pretty straightforward for an adventure game. You have the usual cursors for examining, walking, opening doors, and picking up items. Added to these were cursors for eavesdropping and peeping through keyholes for additional sneakiness. A double-click will allow you to run which you will be doing a lot of. Unfortunately there isn’t an in-game map allowing you to jump from location to location so be prepared to flatfoot it manually. The insert provided in the game does provide 2 printed maps of the upstairs and downstairs. Keep them handy as you will need to refer to them often. The mansion has a plentitude of rooms connected by bathrooms and balconies which will provide multiple entryways when one direction is blocked. This game took me longer to play than it will for most of you. I was not blessed with a sense of direction in real life or animated. I spent a lot of time going in circles, missing short-cuts or just going the wrong direction altogether. But, that’s just me. With the exception of 1 or 2, hotspots are easily identified. However, I would have preferred that a hotspot disappear or at least change after you have completed whatever action was necessary. For example, in one instance the examine cursor remained unchanged giving no indication that you needed to use an item from your inventory in conjunction with it. It would change to a "use" cursor only when the correct inventory item was hovered above it. Perhaps this was intended to "up" the difficulty factor. It also bothered me a bit that I could steal documents and other items from the guests’ bedrooms, but I could never look in their suitcases as that would be improper. Why not? Come on...it is not really an investigation if I can’t rifle through all their stuff, right? Ok, so maybe I’m just nosy. Certainly nothing wrong with that. Puzzles are primarily inventory based and I found them to be leaning towards the easier side in the challenge department. You will not be mumbling to yourself and rocking back and forth, but you also will not breeze right through them without any thought involved. I found them to be quite enjoyable. You may not even realize you missed some puzzles the first time around. While these additional puzzles do not hinder your advancement through the game, they do provide some additional back story on the characters furthering your enjoyment overall. So, in essence, you can play the game again and see if you can find what you missed the first time. Gotta love that! Inventory can be accessed easily on the top left hand side of the screen with a backpack/satchel icon. A journal icon is provided on the top right hand side of the screen. I was impressed with the layout of the journal. Upon examination of any documents in your backpack/satchel, Naracott will automatically transcribe the information into his journal. The document will then disappear from your items inventory, The transcribed documents are accurately labeled and placed under tabs marked "Docs" or "Books" making them easy to find and review at a glance. There is a "Guests" tab documenting information gleaned through interviews and general observations by Naracott. The "General" tab covers any additional information. The game’s graphics are represented in 3D characters against a 2D background. I have heard grumblings that the graphics were not mind-blowing or setting new standards. I find myself thinking "Why must everything be mind-blowing?" In a world where the PC’s we play our games on are outdated the day after we purchase them, why can’t we stay in the moment for a while and just enjoy them for what they are: still beautiful & still relevant. That being said, AWE games created an absorbing environment entirely complimentary to the storyline. The mansion is wonderfully detailed with lovely touches such as being able to see rain and fog out numerous windows along with a reflection of lamps or other items inside. 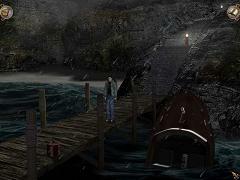 Flashes of lightning add to the tension level and further contribute to the dreary mood. Each room in the mansion is individually decorated with different furniture, wall coverings & lighting giving us a true glimpse into that era. Outdoor environments encompass lush greenery, winding paths, hidden passages, a haunting beach & daunting cliffs. An ever present rolling fog consumes the island. AWE’s depiction of the rough seas surrounding the island is absolutely beautiful and seemingly real. The accompanying music (a haunting piano passage) also fits well, but can become a bit repetitious. 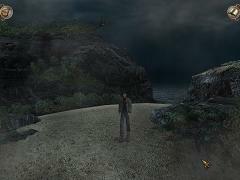 This is easily corrected with an option to turn the music off as well as ambient effects such as shadows, animated water, fog or rain. The character renderings could have used a bit more work. While they have been drawn well and fit quite nicely against each character’s personality, they are a bit stiff at times and speech is not synchronized with the lip movements as well as I would have expected. 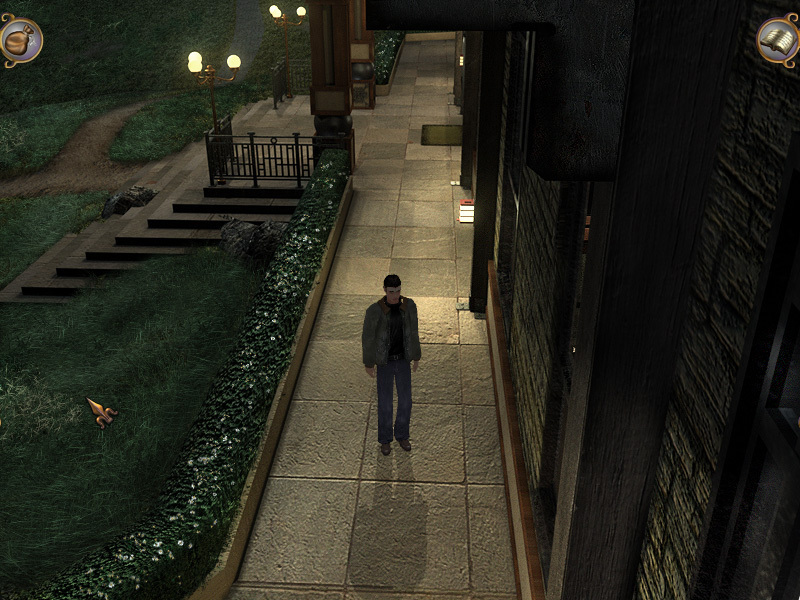 And, there was one odd event where I could see one of the characters dead, but yet also alive at the same time which was a little disconcerting. However, this can be somewhat overlooked as the voice acting is outstanding. I find that in many adventures, at least one or more characters tend to be bit lacking. This is not the case in Agatha Christie: And Then There Were None. AWE really took their time in ensuring this was done right. Kudos to them. From the "I’m more intelligent than all of you" Judge Wargrave to a cold, self-righteous, holier-than-thou Emily Brent to a stately and proper butler named Rogers. Each personality had me changing my mind constantly as to who the real killer is. Of course, if you read the book prior to playing the game, you may already have a preconceived notion as to who is the murderer. Some liberties were taken with the original story to add an element of surprise. In fact, there are 4 possible different endings based solely upon your actions or lack thereof. In addition, upon completion you receive an added bonus feature which is a real treat. I thoroughly enjoyed Agatha Christie: And Then There Were None despite the flaws. If you love a great "Whodunnit" with an engaging storyline, then this game will be a wonderful addition to your collection. The final grade is 84/100.